After trying to keep pace with China in relations with Africa and Central Asia, India is now trying to match it neighbour’s growing footprint in the South Pacific. 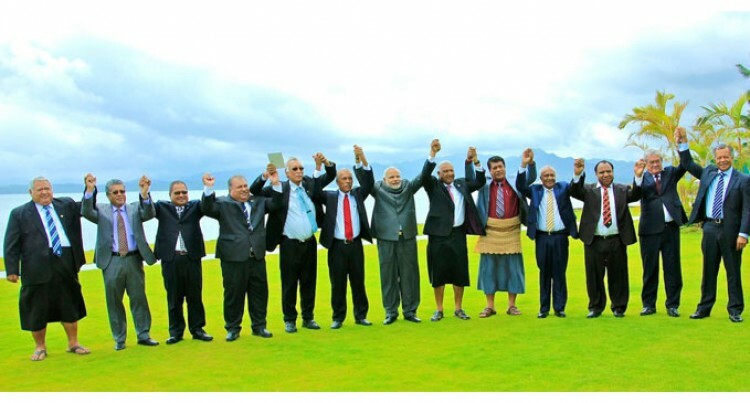 On August 21, India will host the heads of 14 island nations at the Forum for India-Pacific Islands Cooperation (FIPIC), in what is seen as a first step towards greater engagement with the region, which is important from an economic and geostrategic standpoint. The upcoming summit in Jaipur is expected to pave the way for agreements in agriculture, food processing, fisheries, solar energy, e-networks for coordination in telemedicine and tele-education, space cooperation and climate change, all of which were mentioned as areas of potential cooperation by Prime Minister Narendra Modi during his visit to Fiji in 2014. Mr. Modi had then proposed that FIPIC summits be held regularly. He had set the ball rolling for reinforcing ties with the island nations by announcing visa on arrival for their nationals, funds for small business, line of credit for a co-generation power plant for Fiji, and a special adaptation fund for technical assistance and capacity building for countering global warming. Even as New Delhi has begun charting out a plan for forging bilateral and regional ties with these island nations, China has significantly expanded its foothold in the region, from increasing business and trade ties to setting up diplomatic missions in each of these countries. In its report “The geopolitics of Chinese aid: mapping Beijing’s funding in the Pacific”, the Lowy Institute of International Policy says China is now the largest bilateral donor in Fiji and the second largest in the Cook Islands, Papua New Guinea, Samoa, and Tonga. The report also says that between 2006 and 2013, China provided $333 million in bilateral aid to Fiji, even more than Australia ($252 million) and almost three times that of Japan ($117 million), while in Samoa and Tonga, the sum of Chinese aid is second only to Australia’s. China’s foray into the South Pacific, which began as a move to offset Taiwan’s interests in the region, is becoming a cause for concern for India, which now wants to have economic and strategic engagements with the 14 island nations. T.P. Sreenivasan, a former diplomat who served as the head of Mission in Fiji and seven other South Pacific Island States between 1986 and 1989, told The Hindu that India’s strong relations with Fiji, which has considerable influence in the region, was a “strong point” which could help counter the growing Chinese influence. “Most of the economies in the region are based on agriculture, fisheries and small-scale industries and India’s capacity in these sectors is even better than Europe and China; it can cultivate relations with the island nations based on its technology. Even small investments will make a big impact in these regions; many of these countries send their nationals to India for education though programmes sponsored by the Indian Council of Cultural Relations; so India should make a beginning,” he said. He said relations with Fiji had improved in India’s favour in the past decade and not only those of Indian origin but also Fijians were friendly towards Indians, which worked to New Delhi’s “advantage”.